The Chicago area is one of Comcast’s larger markets, but until now it has avoided being part of the cable colossus’s expanding “test” of data caps. That’s about to change, with Comcast subscribers all over the Chicagoland area getting the bad news that they will soon face limits on their monthly data usage. 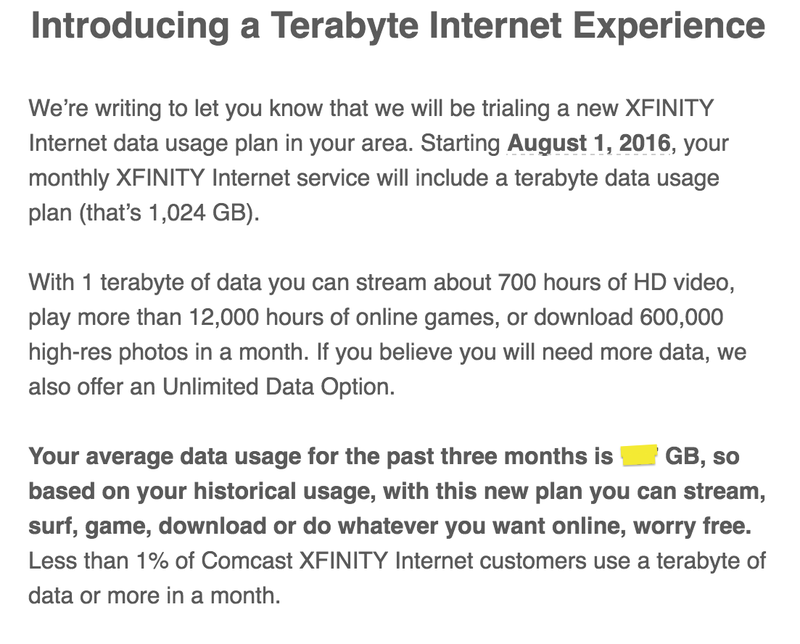 Several Chicago-area Comcast customers have forwarded us emails from the cable/internet provider, with the title “Introducing a Terabyte Internet Experience,” which is the marketing department’s way of informing subscribers that they will soon be capped at 1TB of data/month. The cap will kick in on Aug. 1, according to the emails we’ve seen. These subscribers did not previously have any sort of monthly limit on their Comcast usage. Chicago now joins other major Comcast markets, including Miami and Atlanta, as part of the years-long “trial” that underwent a significant expansion in late 2015. This FAQ from Comcast on the capped plans has the full, current list of markets impacted by the not-really-a-trial-anymore. Earlier this summer — amid thousands of complaints from Comcast customers that their data was being measured inaccurately, or that they were being charged for data they couldn’t possibly have used — Comcast more than tripled the size of the monthly cap to a full terabyte. While that’s more than enough for the large majority of home broadband users, consumers are only going to increase their data usage as streaming video (and especially 4K streaming video) grows more popular, and as more in-home devices are connected to the internet. Additionally, Comcast will soon be rolling out its DOCSIS 3.1 technology that allows for fiberoptic-like data speeds over existing cable lines. That too will only encourage subscribers to devour more data, eventually pushing them to toward the terabyte limit. Of course, with the more forgiving data cap, Comcast made it more expensive to go beyond the cap, raising the monthly add-on price for “unlimited” data to $50 (up from $35). Comcast confirms to Consumerist that Chicago has been added to the not-really-a-trial-anymore-if-we’re-being-honest-about-it, but declined to name which other markets will be added in the future. Several of Comcast’s largest markets — including Philadelphia, Boston, D.C., Seattle, Minneapolis, and Houston — have yet to be included in the cap trials, but the addition of Chicago seems to indicate that even the largest Comcast audiences are destined for data caps. Internal Comcast documents confirm that the company is not enacting these caps to deal with excess congestion. Instead, the company has painted these thresholds as a way of getting the heaviest users to pay more, much like someone who uses a lot of electricity pays the most. However, critics — including Consumerist — have pointed out that Comcast’s analogies in this argument don’t track, as people who use electricity (or water, or natural gas) often pay less on their monthly bill. Comcast offers no such sort of discount for light users. There is also the issue of Comcast exempting data for its own on-demand and streaming content from these data caps, a practice that consumer advocates have called on the FCC to put an end to.